All over the country, falls signals the beginning of the game bird season, which typically runs from mid-October through January. Along with wild turkey, pheasant is near the top of many hunters' favorite game birds list. When it's prepared properly, pheasant makes a tasty meal. Pheasant is a medium-sized game bird, so you may need two to feed a family of four. Once your hunter has bagged, dressed and cleaned the pheasant, you can cook it in a number of ways, including frying. Farm-raised pheasant is also available in supermarkets and specialty food shops. Preheat the cooking oil in your deep fryer to 375 to 400 degrees Fahrenheit. Rinse each pheasant in cool running water, and pat them completely dry using paper towels. 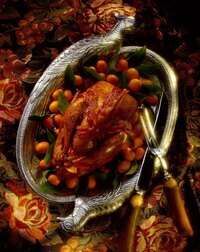 Remove the skin from each pheasant, and tease the breast and thigh meat away from the carcass with a sharp knife. Place the meat on a cutting board. Sprinkle each piece of meat with a light coating of meat tenderizer. Pheasant meat is a bit tougher and drier than chicken or turkey, and the meat tenderizer helps keep it moist and tender during cooking. Pound the meat lightly with a meat mallet, until all pieces are an equal size and thickness. Use a sharp knife to slice the pheasant meat into strips, and set them aside. Beat the egg and milk together in a small-to-medium mixing bowl, using a whisk or fork. Combine the flour, instant potato flakes, crushed crackers, salt and pepper in another medium-sized mixing bowl. Dip each strip of pheasant meat into the egg mixture. Then dredge it in the flour mixture, rolling it around several times until it's thoroughly coated. Place eat strip of pheasant meat into the deep fryer. Fry the strips until the coating turns a nice golden brown, about 5 minutes. Remove the strips from the heated oil with a slotted spoon, and set them on paper towels to drain. Figure on getting about two servings from each pheasant. As an alternate and tasty way of tenderizing it, place the pheasant meat in a large bowl, covering it completely with milk. Cover the bowl and put it in the refrigerator, allowing the meat to soak for 6 hours. Use a 10-inch or 12-inch cast iron skillet to fry pheasant meat instead of a deep fryer, using 1 cup of canola oil or bacon fat from approximately six strips of bacon. Use a candy/oil thermometer to check the temperature of the oil in the skillet. Leave the skin intact and immerse the entire pheasant in your deep fryer to fry the whole bird at once, if your deep fryer is large enough. Take care not to overcook your pheasant meat. Overcooking causes it to become very tough and dry.